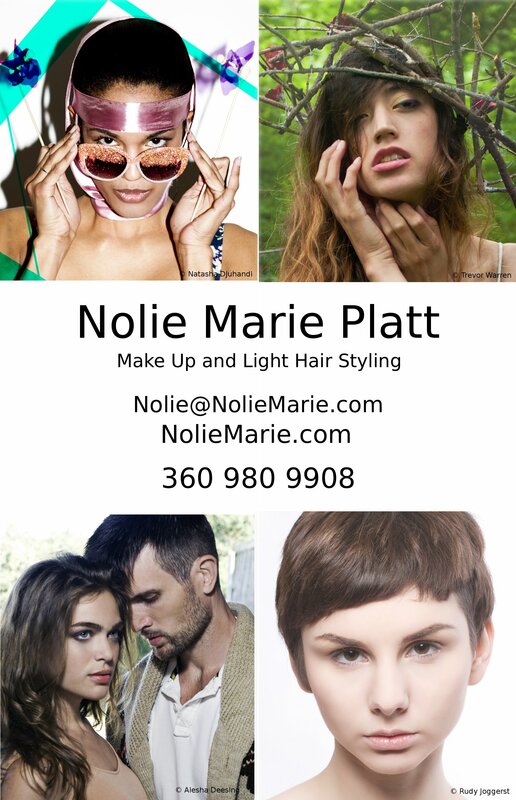 Nolie Marie Platt discovered makeup art during her teens, learning art for theatrical performances. Upon retiring from the stage, she studied with photographers in New York City, Philadelphia, and Portland, and refined her makeup skills to create unique images in a new context. Nolie Marie has studied in a variety of other media: pastels, charcoal, oil, acrylic, watercolors, ceramics and textiles. She incorporates techniques and elements from these media into the design of her work, and draws inspiration from the pattern of trim on a dress, the texture of curls in a hairstyle, or the ambience of a lighting setup. Nolie Marie continues to perfect her art, assisting or studying under many of Portland's talented commerical artists. She offers a variety of services, including airbrush makeup, tattoo cover, and light hair styling. Her past clients include Iris Educational Media, Solestruck, R.A.W. Textiles, Emit Apparel, and Elizabeth Perry Collections. Full resume available on request. She provides makeup art for film, photography, and events in the Portland, Oregon area. Download her comp card, or contact her for information on booking.